Mars, the Red Planet, may seem beyond reach in this view from NASA's Hubble Space Telescope in 2003. But the space company Uwingu has launched a "Beam Me to Mars" project to let the public send messages to the Red Planet in order to raise funds for space exploration. You may never set foot on Mars, but your words and pictures could land there later this year. On Aug. 19, 2014, the space-funding company Uwingu launched an effort to beam to Mars names and messages submitted by the public. The transmission will take place on Nov. 28, 2014, the 50th anniversary of the launch of NASA's Mars-studying Mariner 4 probe. Other goals for Beam Me to Mars include raising lots of money to fund space science, exploration and education (Uwingu's stated chief purpose) and letting policymakers know how important space exploration is to their constituents, Stern added. "We want to make an impression on leaders," he told Space.com. "The more messages, the bigger impression it makes. If this thing goes viral, and it becomes the thing to do, then it'll make a huge impression." You can beam your name — or someone else's — to the Red Planet for $4.95. For $9.95, you can contribute a name and a 100-character message, while $19.95 gets you a 1,000-character note instead of the shorter one. If you want to splurge, $99 gets you a name, a long message and an image of your choosing. The messages will be searchable for free on Uwingu's website, company representatives said. Submissions must be made via uwingu.com by Nov. 5. 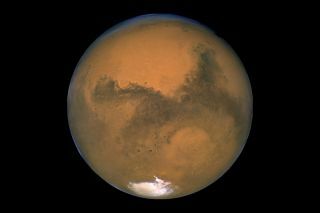 Uwingu (whose name means "sky" in Swahili) and its transmission partner, communications provider Universal Space Network, will use radio telescopes to beam the messages at Mars on Nov. 28 at the rate of 1 million bits per second. The transmission, traveling at the speed of light, will reach the Red Planet on that day in just 15 minutes, Uwingu representatives said. For comparison, it took Mariner 4 more than seven months to get to Mars a half-century ago. The probe didn't touch down, but its historic flyby in July 1965 provided the first up-close look at the surface of another planet from deep space. This is not the first Mars effort for Uwingu, which was founded in 2012. In February, the company launched its "People's Map of Mars," asking the public to name Red Planet landmarks for a small fee. To date, people have named more than 12,000 Mars craters, and Uwingu has set aside more than $100,000 for grants, company representatives said.